Amazon is having a huge sale on Blu-Ray discs — 50% off more than 100 titles. Not too shabby! The sale ends June 9. Sorry if this seems a bit spammy. Because I'm an Amazon.com Associate, I get notices of big sales, and this one seems perfect for anyone who recently bought a Blu-Ray player and is looking to build a library of decent movies. Continuing where my last blog left off, another great choice for people looking for an alternative web browser is Apple's Safari web browser. The latest version, 3.1.1, was recently released, and continues to be among the fastest web browsers available. This release rivals Firefox 3 in terms of performance. It's fast. For example, when typing a new forum post using Safari, click the Preview button and see how fast the popup window animates open. Both Safari and Firefox do it very quickly. Safari is one of four web browsers I test when developing new features at Lottery Post, so if you decide to use Safari, it will be compatible with Lottery Post. Forget about installing the Bonjour service. Un-check the checkbox for Bonjour in the installation wizard. It just adds unnecessary overhead to your PC. I always turn off the Apple update service, because it's a little intrusive for my likes. It can also be un-checked during installation. Safari probably supports more of the upcoming HTML/CSS features of any browser out there, making it an interesting choice. It also has a very different look than regular Windows, so that will be either a really big plus or negative, depending on how you like the look. "Release Candidates" (RC) are the final step before a company releases an official software product. It signifies that all the features (or nearly all) that will be in the final product are in the RC. It's like a trial release, to see if major bugs crop up before the official release. So that's why it's exciting to see Firefox 3 RC1 has just been released. It means that it's fairly safe for anyone to download and use, although everyone does so wih the understanding that there may be some small glitches here and there, and that they'll need to upgrade to the "real thing" when it's eventually released. Everything looks great, and this browser continues to be the fastest I've ever used. This thing rocks. One word of caution: Mozilla has tried to sneak a fast one in on the installation process, and will make Firefox your system default web browser unless you're careful. 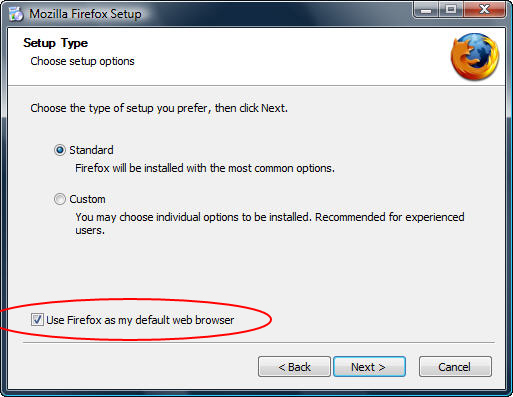 When you get to the installation step below, be sure to un-check the box indicated if you don't want Firefox 3 to be the default web browser on your computer. For example, if IE7 is your primary web browser, and you want to keep it that way, be sure to un-check the box. Now that Toshiba has [sadly] pulled the plug on HD-DVD, I faced the obvious conclusion that I would be forced to get a Blu-ray player if I wanted to continue to enjoy movies in hi-def. The awful truth about Blu-ray is that it was released to the public before the "good" features were baked in. For example, picture-in-picture and Internet-based content. Those features, which were part of the HD-DVD standard for a long time, and built into all the players, was not even a part of the Blu-ray spec until "version 2.0". Worse, people who bought Blu-ray players from the time it was released until the present cannot even upgrade their players to the new spec, so they will have to purchase a completely new player if they want to do everything the format is capable of. That is, unless they purchased the player I'm recommending: a PlayStation 3 ("PS3"). That's right, a video game console is the very best Blu-ray player you can buy. Any PS3 is entirely upgradeable to whatever features Sony comes out with, because inside the unit is a fairly high-powered computer with something called a "cell processor". So when you buy a PS3 and plug it in for the first time, the first thing it does is "dial home" to Sony (via built-in Ethernet network connection and/or Wi-Fi) and download the latest firmware upgrades. After the initial download, you have a Blu-ray player with all the features that exist, and those features are available to you before any of the dedicated players with those same features even hit the market. As far as ease of use is concerned, the PS3 is awesome. The menu system is a cinch to navigate, and works exactly like Windows Media Center. You use the 4-way navigation control to move left and right to get to the major category you want (like Setup, Video, Games, Music, etc. ), and then move up and down within the category to select the function you want within that category. All the navigation is done on-screen. There are no front-panel controls or indicators (other than a Power light), so there is no confusion about how to control the thing. Also, you can operate the PS3 with a regular remote control (for an extra $24), so it operates just like any regular DVD player. Movies play with no jitters, stutters, or glitches (at least the ones I've tried). It gives you a very confident feeling that anything will play perfectly, and that's something I could not say about any other hi-def player. Again, I believe that feeling of power comes from the over-powered cell processor at the heart of the system. Stand-alone players just do not have that kind of horsepower. I picked up one game for the PS3, mainly so I could see what it's like to play a hi-definition game in 1080p on a 100" movie screen with 7.1 surround sound. So I bought Gran Turismo 5 Prologue. It's hard to find words for something so ridiculously cool. The game is so realistic it can be hard to play, because you just want to stand back and admire its beauty. I love the replay feature, which lets you watch the race you just played, from the point of view of "cameras" placed all over the place, panning, zoom, and swooping artistically around, as you watch yourself trying to control the car, and driving into walls (hysterically, with the crowd trying to get out of your way). This is not a topic about games, so I'll just leave it at that. For Blu-ray, you now have my firm recommendation. The PS3 is a great way to "future-proof" your investment, while providing an incredibly solid and easy-to-use playback experience.